Why is this frame so expensive? – All glasses are not created equal. Of course we all love the fashion side of eyewear. It’s fun to try on new styles and see how each one changes your overall look. Chunky frames, for example, make a bold, artsy statement while ultrathin metal frames provide a minimalist look that lets your lovely face take the center stage. What matters more is that eyeglasses are a medical device and you’re going to live with this device for the next year or two. So, durability, safety and function matter just as much as the fashion side. 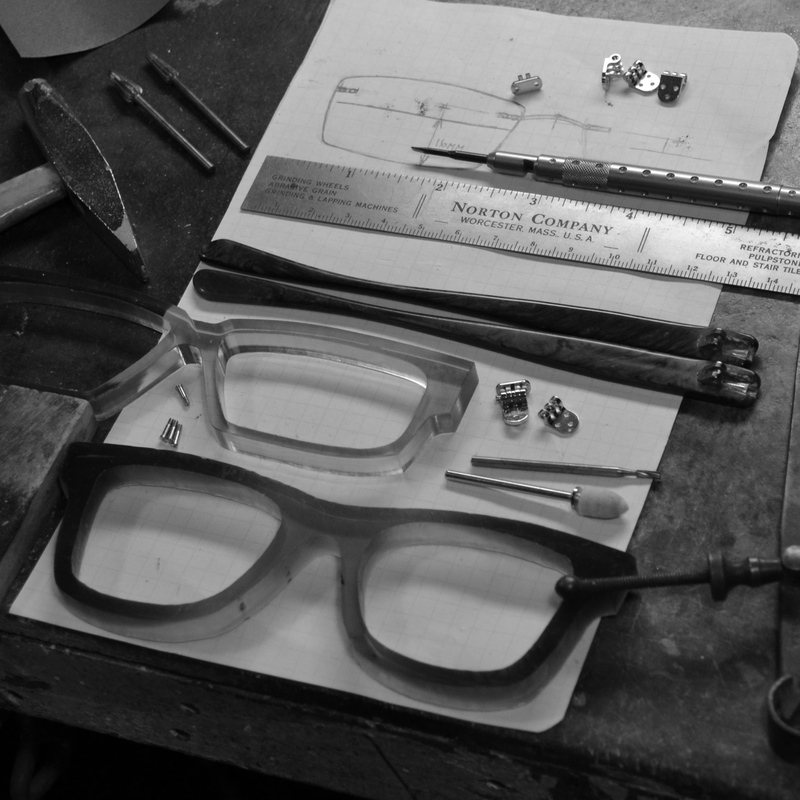 Top notch eyewear manufacturers pay attention to both sides of the equation. They hire designers who are in tune with – and sometimes even innovators in – the fashion industry. At the same time, they use manufacturing processes that include rigorous testing and inspection to ensure the frames will fit properly and stand up to the normal knocks of everyday life. 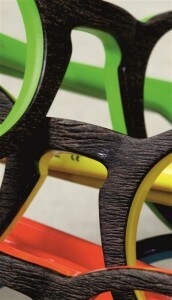 Most plastic frames are made of acetate, but this category covers a wide range of blended materials, which can include cellulose, nylon, cotton, wood and even castor oil. The weight and durability varies depending on the materials used in the acetate and the manufacturing processes. 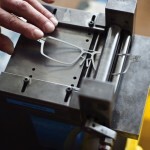 KEY FACT: The very best handmade acetates in the world are manufactured in Italy. Mazzucchelli 1849 is the worldwide leader in the manufacture and distribution of cellulose acetate, a plastic material traditionally used in the production of spectacles and sunglasses. 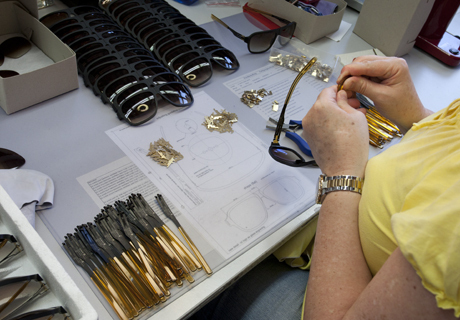 They develop also exclusive acetate designs for some of the high end eyewear companies. Color blends (think tortoise shell and similar color swirls) cost more to manufacture. Each color is created separately and then the colors are brought together in a complicated way that allows the colors to coexist without blending completely into a new, solid shade. Because each color has a slightly different chemical composition, this process requires testing to ensure that the colors will adhere to each other so that the frame doesn’t break apart at points where the color patches touch. Layering is another factor that adds cost to the production of plastics. Frames that have a different color on the inside and outside cost more to produce, but they give a flash of alternate color that makes them interesting and fashionable. Similarly, a shiny, clear inside layer (sometimes called “crystal”) balances the heavy color on the outside of the frame and makes it look less overwhelming. This is especially helpful if you want a bold look, but have delicate facial features. Some high fashion frames have as many as four transparent layers in different shades that give the effect of looking into a deep, clear pool of color. Polishing: For plastic frames to look their best and feel comfortable, particularly over your ears, polishing is an extra step that costs more, but is well worth it. Some high fashion frames with carved designs in the temple are hand polished for as much as 15 minutes, which makes the design look smoothly embossed rather than roughly chiseled. TIP: Before purchasing a frame, hold the temple between your index finger and thumb and slide your hand up and down over the portion that fits over your ear. If it doesn’t feel really smooth, it’s likely to irritate the top or back of your ear. All eyewear metals resist corrosion and warping and they bend easily for a really good fit, but the durability and the weight depends on which metals are used. 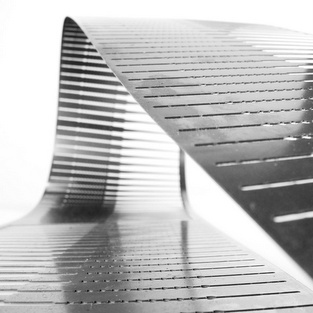 Metal blends (known as monel) are the least expensive type in this category, but also the heaviest and least durable. They frequently have an outer coating that looks good, but wears off to reveal a dull gray metal underneath. Stainless steel is more durable and slightly more expensive, but is still relatively heavy and only comes in only one shade. Typically it does not have an outer layer that wears off. Titanium is more expensive, but it’s very lightweight and strong, so manufacturers can create frames that are much thinner and yet stronger. Titanium also can easily be coated with matte color for a wider range of fashion options. Hinge failure is the number one cause of eyeglasses breaking beyond the point of repair. Hinges can either break internally (especially spring hinges) or pull apart from the point where they are joined to the front of the frame. TIP: Before you purchase a pair of frames, hold them in the palm of your hand and open and close one temple. You’ll be able to tell right away if it’s a cheap, weak hinge or one that has resilience. 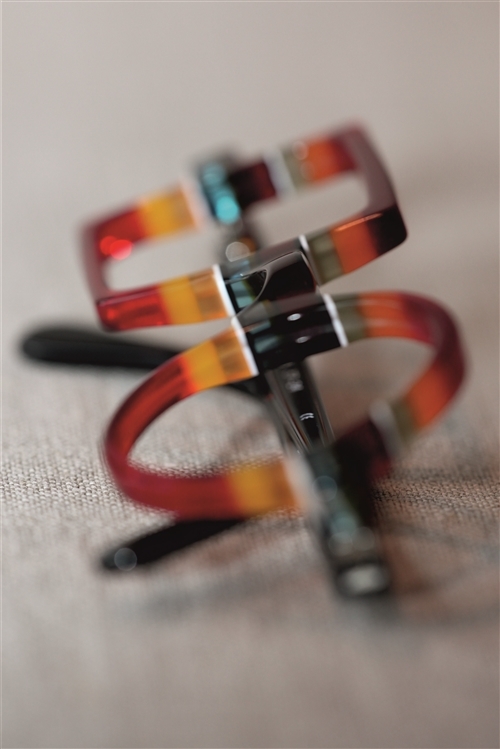 KEY FACT: The very best hinges in the optical industry are made in Germany. Online websites have fun tools that let you upload a picture and “try on” various eyeglass frames, but the truth is, you can’t tell how a frame will fit and feel without trying it on. Even if a frame feels good when you first try it on, it may not be the best option for you. A trained optician can point out subtle problems, like when the nosepiece on a plastic frame is the wrong shape for your nose and will cause slippage, or when the temples are too close or too far from the side of your face to get and maintain a comfortable fit. Getting the frame to sit properly and stay there is crucial to comfort and to your vision. Why? Because lenses have an optical center that must ride over your pupils or you will have blurred vision or eye fatigue. This is even more critical if you wear progressive or bifocal lenses. Make sure you ask about the manufacturer’s guarantee. Cheap frames typically are warranted for 90 days. Quality frames usually carry at least a one-year guarantee and some have two-year coverage. Some manufacturers of children’s frames also offer free replacement if your adorable little rough-houser breaks or loses his glasses within a year.